Almost 30% of users don't back up their important documents stored on their smartphones and tablets. Here we explain how to back up files, customized settings, and conversations on Android. A recent study conducted by Western Digital has uncovered alarming statistics related to user habits when it comes to making backup copies of their information. 27% of those interviewed had lost valuable information on their mobile devices at least once because they’d never made a backup. This fact is even more shocking if you consider the number of services and tools that exist to automate this process. Here, we’ll explain a few different ways to back up the information stored on your Android smartphone or tablet. Google offers the option to save photos and videos to any Gmail account that has this service activated. To synchronize all your configuration options, you just have to go to Settings > Accounts and enable all the elements in the associated Gmail account. There you’ll have the calendar, app data, and contacts, among other options. If you enable them all and your phone is ever reset or you set up your account on a new device, then all your information will automatically be downloaded from the automatic backups created by Google. 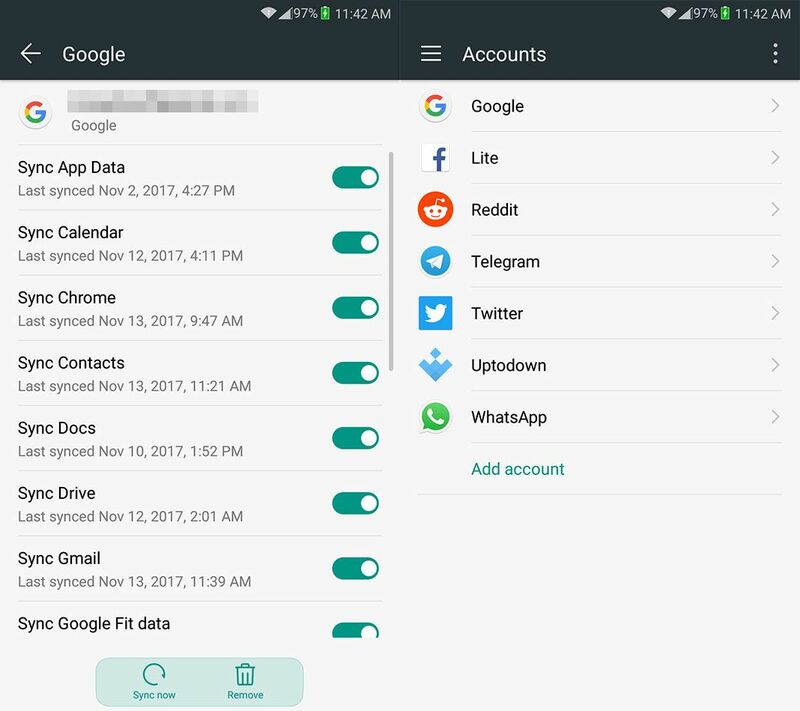 The internal configuration of the apps won’t automatically be synchronized, and it’ll depend if each one offers this option individually, but you will have a list saved of all the apps you had installed at the time of the reset or loss, so you won’t have any trouble figuring out what apps you had and need to reinstall. Ah, the classic problem of losing your contacts because you never made a backup copy. 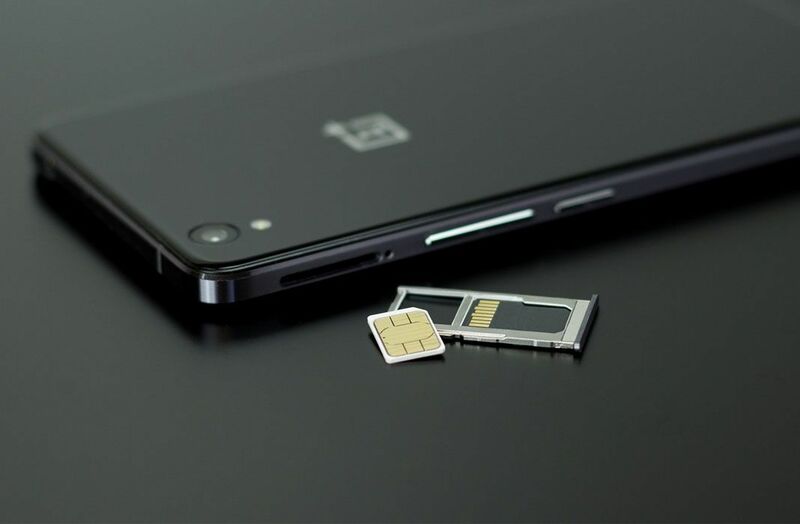 The main reason for this is that most users still don’t know how to tell if their contacts are stored on their SIM card or in their personal account. And apparently it’s not their fault, but instead results from an interface and presentation that’s anything but intuitive. 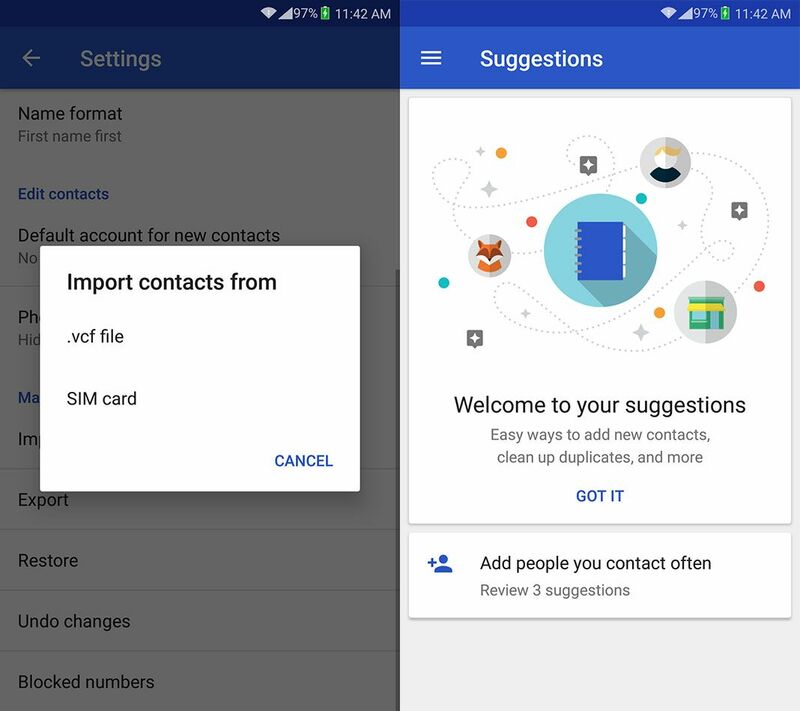 While each layer of customization has its own contact management system, we’re going to use the Contacts app from Google to complete the process now that we can install it on any device. Once you have it installed, you open the side menu and go to Settings > Import > SIM Card. This way you can dump all the content from the SIM card on the device. Next, even though the backup copy will automatically be created since it’s associated with your Gmail account, you’ll make a backup copy of everything and Export. After going through this process, when you do a factory reset and have information sync activated, you’ll automatically have all your contacts. If you prefer to recover them manually from the exported file instead, then you’ll simply use the Restore option. If you ever do lose your contacts, you’ll probably get over it pretty quickly. However, losing the hundreds of photos and videos you have stored locally on your device is another story. You need to be pretty out of it to not back up all this information, but as the study mentioned in the first paragraph demonstrated, it’s more common than you’d think. The easiest way to synchronize all this multimedia material is by using the free backup service offered by Google Photos. Once you have the app installed, you have to go to Settings > Back up & sync. Once you’re there and activate the back up and sync option, then all your photos and videos will automatically be saved to the cloud. That said, if you want to have unlimited space, then you need to make sure you select High Quality in the section where it says Upload Size. By default, synchronization will only take place when you’re connected to WiFi. Google isn’t the only service that offers automatic synchronization and storage in the cloud. If you’re more of a Microsoft fan, the official OneDrive app also offers an automatic system for storing your multimedia material in an online storage space. Or, if you have Amazon Premium, Amazon Cloud Drive gives you 5GB of storage for free. We’re going to mention an individual case, seeing as it is the most widespread messaging service in the world. 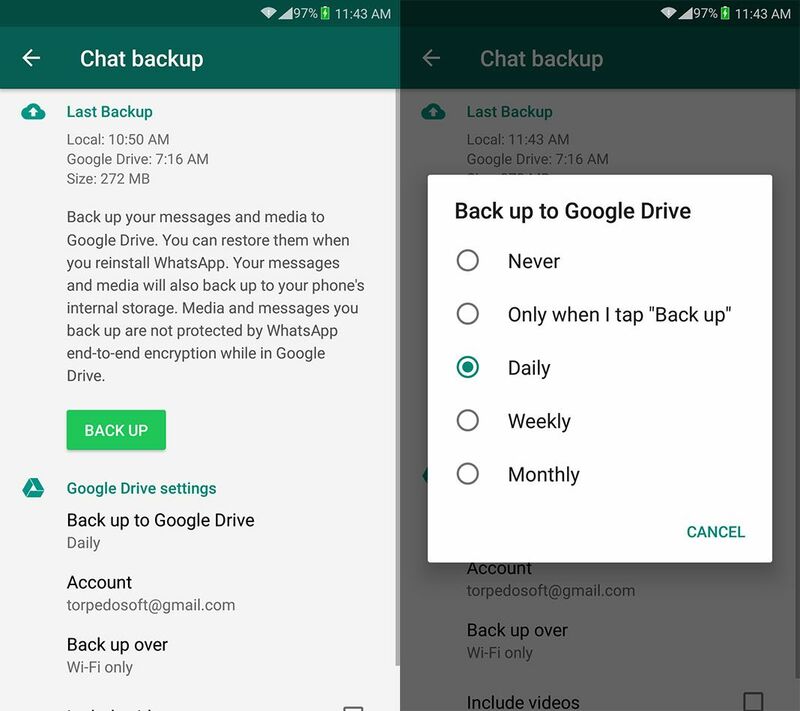 WhatsApp offers its own back up system for contacts and multimedia files sent and received through the service backed by Google Drive. When you go to Settings > Chats > Chat backup you can enable automatic synchronization to make a periodic backup. 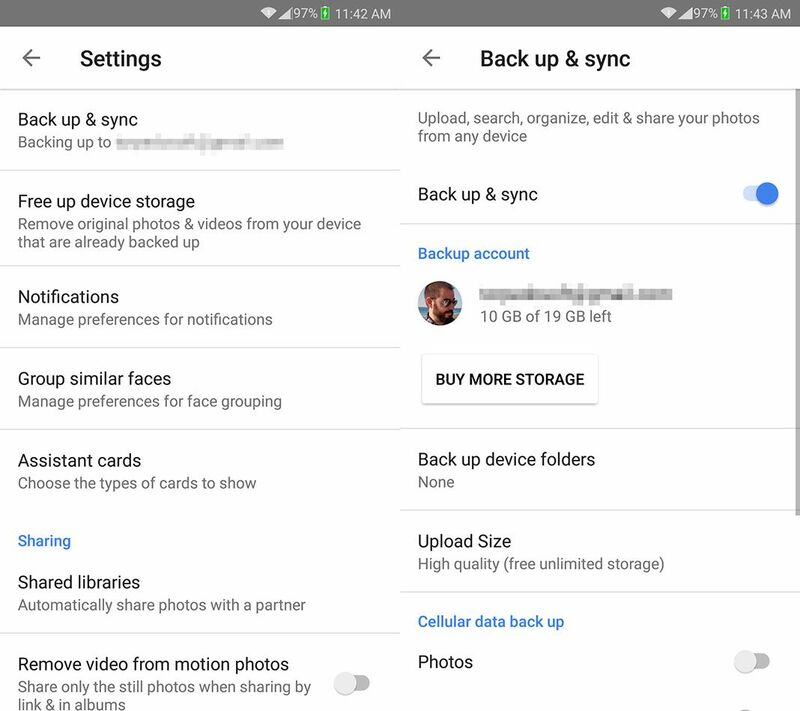 Among the customization options, you can choose how often to make backups, limit them to only be created when connected to WiFi, and include backups of videos (only photos are included by default). Please tell me something more smart ie: how make local backup in a flash memory o mac book or maybe pc.